Before the mortgage crisis, it was common for banks and lenders to provide the best mortgage rate pricing to borrowers with credit scores of 720 and above. During that time, scores of 720+ made up the top pricing tier and as such were considered “good” or even “excellent” credit to most in the industry. In fact, it didn’t really benefit you to have a credit score above 720 because the pricing incentives tended to stop at 720. So a borrower with an 800 credit score was treated much the same as a borrower with a 720 credit score, unless the underwriter got really subjective. Post-crisis, credit scores of 740 and above became the new benchmark, with that group of borrowers receiving the best pricing. But it’s all about to change again, thanks to new guidance from Fannie Mae and Freddie Mac. The pair released new pricing guidelines for conforming mortgage loans this week that add all types of new credit score thresholds, which challenge what a good credit score really is. Is a 780 Credit Score the New 740 Credit Score? Beginning next spring, April 1st to be exact, there will be new credit-scoring tiers as high as 800+ for loans delivered to Fannie Mae and Freddie Mac. So instead of shooting for a 740 credit score, you’ll have to aim for a 780 score to ensure you receive the most favorable pricing on your new mortgage. For the record, both the 780-799 and the 800+ credit-scoring tiers have the same pricing as of now, but that could change in the future. In other words, 800 credit scores might matter in the mortgage industry in the not-too-distant future if regulators decide to further punish borrowers. As expected, the industry is pretty upset about this, considering the fact that it comes when mortgage rates are already pricing about a percentage point higher than recent lows. That, coupled with higher home prices, will make it increasingly difficulty for the average family to purchase a home. 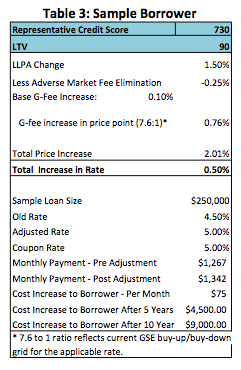 The upside is that the FHFA, which oversees Fannie and Freddie, also announced that it is doing away with the 0.25% adverse market delivery charge (AMDC), which will offset some of the pricing increases. Note: It will remain in place for properties in Connecticut, Florida, New Jersey, and New York. At the same time, the FHFA also said g-fees (charged for securitizing underlying mortgages and insuring default risk) would rise a further 10 basis points (0.10%). Which Borrowers Will Get Hit the Most? The current pricing at Fannie Mae actually rewards those with credit scores of 700 and higher at low LTVs. The proposed credit scoring tiers include scores above 800. If you compare the current pricing tiers to the proposed structure, borrowers with credit scores of 720-739 with LTVs between 85.01% and 95% will pay the most as a result of the changes. For these borrowers, pricing will be 1.25% higher, or $1,250 more per $100,000 borrowed, with the absence of the adverse market delivery charge factored in. Meanwhile, borrowers with scores between 740 and 759 with LTVs ranging from 80.01-95% will pay 1% more. There are similar hits for those with credit scores of 680 and above coupled with higher LTVs. As you can see, it will be quite significant for some home buyers, especially those just scraping by thanks to the higher rates and home prices. Interestingly, those with credit scores between 620 and 659 won’t be hit at all, if you factor in the removal of the AMDC. So in essence, those with traditionally good to great credit scores are being punished by the new rules, whereas those with marginal credit will continue to receive existing pricing. This should really push borrowers with good credit to put more money down when purchasing a home, or force prospective buyers to purchase cheaper homes. It could also send some borrowers back to the FHA, which appeared to price itself out of the market after all its recent premium changes. While this may come off as undue punishment, it looks to be a continued effort to bring private capital back to the mortgage market, and in turn rely less on the government to keep things afloat. It’ll be interesting to see if lobbying efforts block these changes, seeing that the housing market is still quite fragile. Stay tuned! And work on your credit score! Read more: What mortgage rate can I get with my credit score?